The inner dialogue of a person engaged in weeding a garden can go in a number of directions. There is the associative focus of separating good plants from bad, and yanking the weeds by the roots. There is also the dissociative tendency to let your mind wander and weigh your life along with everything in it. A little of both is likely required to do a good job weeding. One must pay attention to identify weeds amongst the plants we choose for ornament and beauty. But sometimes weeds are so thick it does not take much thought to do the job. You stick your hands in there and yank for all you’re worth. Little thought is required, only muscle. Over the years, one learns the best way to weed through practice. There is no other substitute for experience. One learns which plants are easy to pull up by the roots and which break off in your hands four to six inches from the soil. That makes for bigger problems. A trowel needs to come into play. There is not enough leverage left on the slimy stem of the weed to get a grip and yank up the roots. Otherwise the weeds come back. Well, they come back no matter the method of removal. They’re weeds. That’s what they do. There’s always a supply of new weeds to fill in for the old ones. One learns this lesson in your own yard and garden easy enough. Weeding is a required activity if you attempt to grow anything at all. Of course, weeds are also at times a matter of perspective. Gardeners grow some varieties of plants that can escape and propagate places where they are not welcome. Purple loosestrife is one such beautiful pest. In a garden they are quite beautiful. But unleashed in a wetland they can take over an entire ecosystem. At that point, they must be yanked or otherwise killed off. There are entire woodlands that need to be managed for the influx of plant colonies such as garlic mustard and buckthorn. Natural area restoration crews descend on these colonies and yank, burn and poison them to death. But the weeds almost always come back. It’s what they do. That makes it all the more triumphant when the results of weeding actually do work. Perhaps there is no more profound example than that of a managed prairie. It can take years of propagation and burning to kill off the weed colonies and invasive species. But when prairie plants are given a chance, their competition strategies are smart and strong. The roots grow deep and the soul of the plant lies below the surface. That means burning takes off the dried up stems but does not affect the rich underground root system that also taps deep into the soil to gain moisture. Hot summer days do not kill these plants. So nature invented weeding, on its own. But humans love to create environments with the appearance of natural balance that are, in fact, a stripped down version of nature that can be hard to sustain. Golf courses are one such example, and for years their strategy was to bathe the fairways and greens in dangerous chemicals as weed control. The monoculture necessary to allow the game of golf to be played requires intensive weed strategies that for decades contributed to ground pollution and other problems. Our lawns at home often depend on such chemicals. Some are relatively benign and go away quickly. Others persist, and it would be much better for the world if these strategies were weeded out of our eco-strategies. One of my neighbors does not believe in lawn chemicals. That meant her yard become overgrown several summers in a row. She could not tell the weeds from her plantings. Finally I offered to help weed her lawn. She is a good Christian woman and had been praying about what to do for her lawn. Money was tight for her at the time and a full-on landscaping company was out of the question. So I offered to weed. My late wife was glad that I did this. The Creeping Charlie from her yard had grown all the way through her lawn to reach the edge of our garden. When I dug into the mats of Creeping Charlie it could be hauled up like sheets of laundry. That work revealed an entire system of hostas and small groundcover plants that thrived once the weeds were removed. There were giant, towering thistles as well, and old, dried-up cedar trees in need of removal. The process took several days, and my wife grew impatient with my dedication to the task. I quietly told her it was a duty that somehow called me. Nothing else. There was no husband or helper available to our neighbor at the time. So I lent my services in that department. I knew how to weed. Since that time a man has come into her life, and a bit of money too. First he tore into the landscaping and removed many of the weeds, mulched the gardens and tore up funky trees. Then a landscape service began to show up and a beautiful new fence was installed. I love her new fence. It’s a wonderful backdrop for my own garden. Recently a family I know also needed some weeding around their yard. The husband has been dealing with the progressive effects of ALS for years now. His devoted wife keeps up with everything the best she can, but the duties and commitments of things like yard upkeep are not possible, yet are relentless. The family now also has grandchildren to enjoy. This is the property of life, which is so often counterbalanced by the weeds of existence. It takes a strategy of caregiving to manage these priorities. So it was with some joy that we organized a small community of workers from our church to do some weeding around their yard. 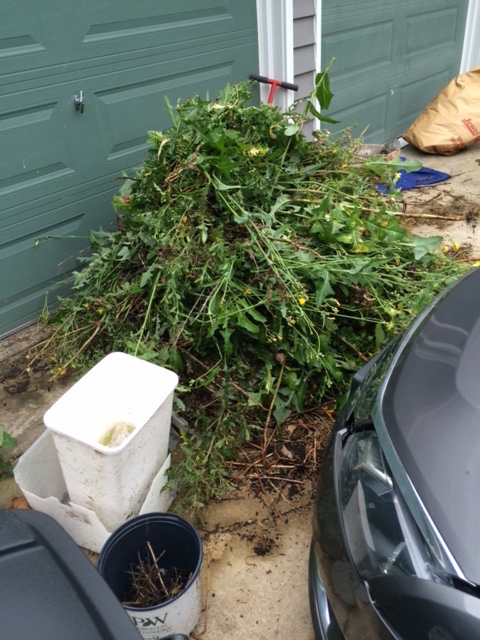 The resultant piles of thick weeds piled five feet high. Along the north side of their property the landscaping was obscured by groundcover gone out of control. In fact some of it had died for lack of light. The daylilies competed with thistles and mulberry trees shot up through the arms of the spruce trees. All the weeds and overgrowth had to be inspected, sorted and removed. The tall mulberries were sawed up and heaped on the curb. The weeds were stubborn and thick, but the loose mulch gave up the roots easily enough. 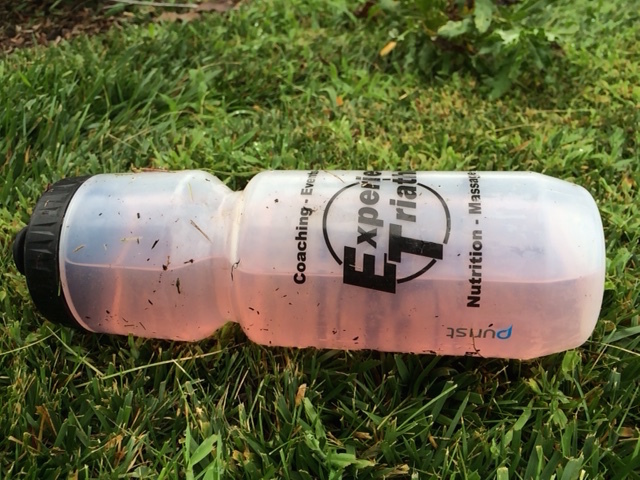 It was hot, and it was thirsty work. But it was worth it. All the time I was out weeding I thought of my friend Steve inside the house. This was his garden, and his love. It exhibited his character. I could see the organization of the plants and the landscaping at every turn. His wife told me how much he loved to garden. There were beautiful plants; butterfly weed (how ironic?) and many more. As the shape of the garden emerged again I thought of how Steve and I first met. Our children were in high school music and drama together and something between us clicked after we met. He’d join me for lunch over at the Country House restaurant where they served nice fat burgers and cold beer. There were several meetings where he talked me through issues of depression related to some of life’s changes and work issues. Then my wife had cancer and Steve was there for that too. Meanwhile his own health issues began to emerge. It became difficult for him to open the huge wooden door at Country House. There was a growing weakness in his system that could not be identified. It progressed and was finally diagnosed as ALS. He has never let it stop him from living life, thinking through his writing and enjoying the company of all those who love him and his family. And there are many. Steve and I helped each other weed through those depressive instincts years ago. We weeded out the negative thoughts to make room for positivity and hope to grow. That is a garden worth tending every day. Every year. Every life. Christopher Cudworth is author of the book The Right Kind of Pride. It is available in print form on Amazon.com.